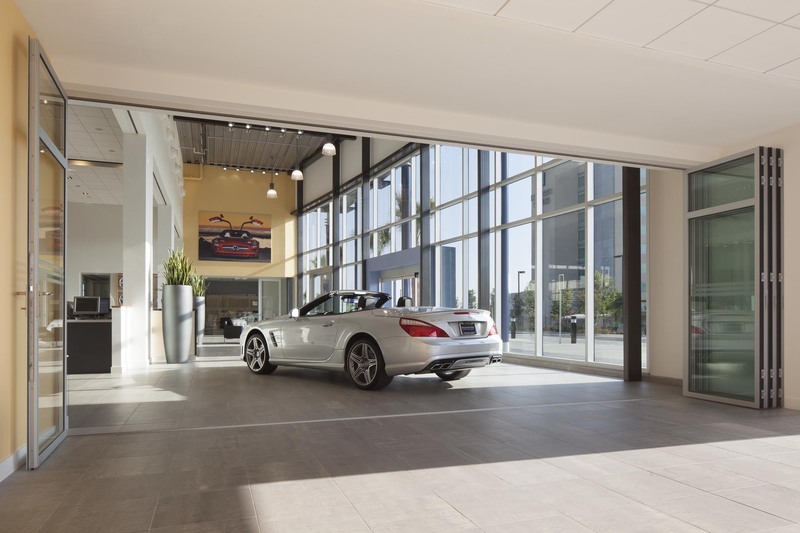 For its client Fletcher Jones, one of the most successful luxury auto dealers in the United States, Gensler used its multidisciplinary design approach to integrate branding and architecture into a memorable customer experience in Ontario, California. The glass display case continues indoors. In the 100,000-square-foot Ontario dealership, Gensler senior associate Deeg Snyder encloses its double-height lobby from adjacent spaces without losing any daylight, views or functionality. 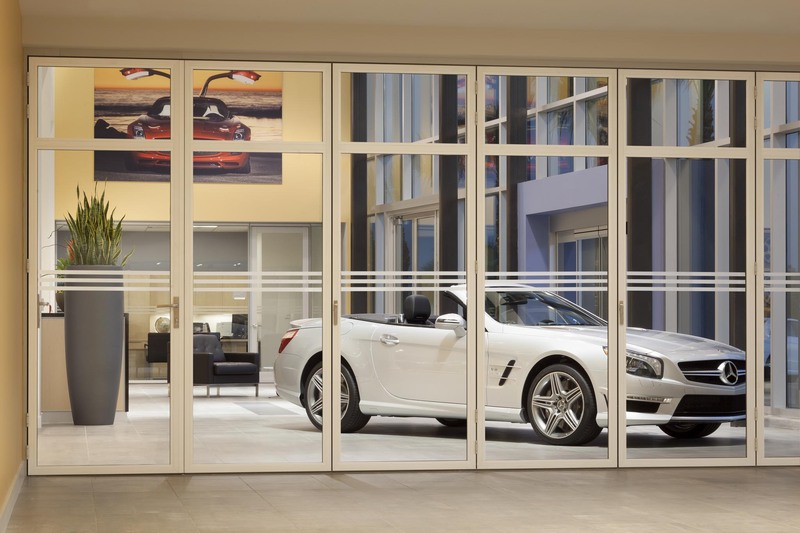 An operable NanaWall SL45 Aluminum Framed Folding System provides a sense of openness, while presenting the latest cars in a museum-like setting. “Car access to a showroom space is always a challenge, and there are few products which can provide a 9- to 12-foot clear width and still match the interior storefront design of the rest of the project as to not stand out,” says Snyder. 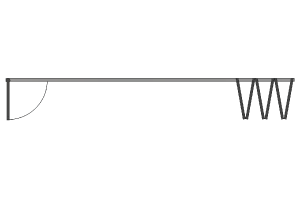 “This product doesn’t have the deflection or sag of many of the other products on the market,” he says of the NanaWall. The sleekly detailed glass-and-aluminum partition was ideal for the application, says Snyder. “The design aesthetic doesn’t compete or make itself a star, allowing the architecture and product to be the true focus in the space,” he explains. 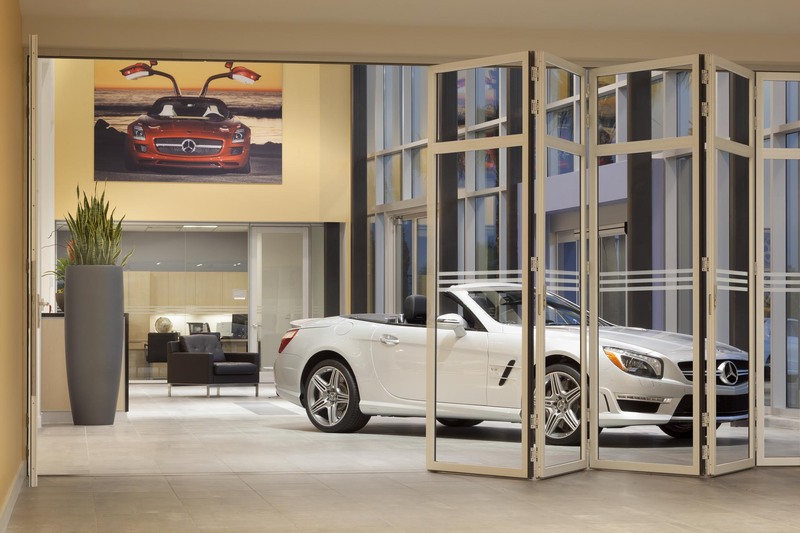 To tie in with this global luxury brand, Gensler’s Chicago-based team focused on a mix of comfort, glamor and exceptional engineering. Facilities across the country for Fletcher Jones employ traditional elements of the autohaus – German car dealerships – with contemporary conveniences. Framed by precast, the main glass-and-metal façades act as billboards, beckoning passing cars to come into the LEED-rated locations to see the latest models on display. 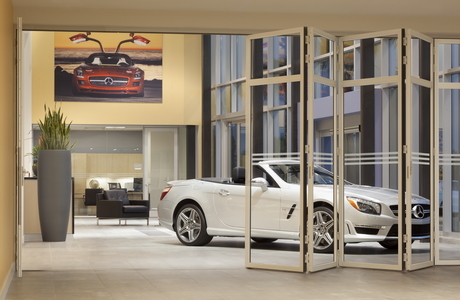 The glass opening doors of the NanaWall system indoors also provide a window-within-a-window view of the latest Mercedes products. Views through the transparent façades that face the nearby freeway are dramatic both day and night. 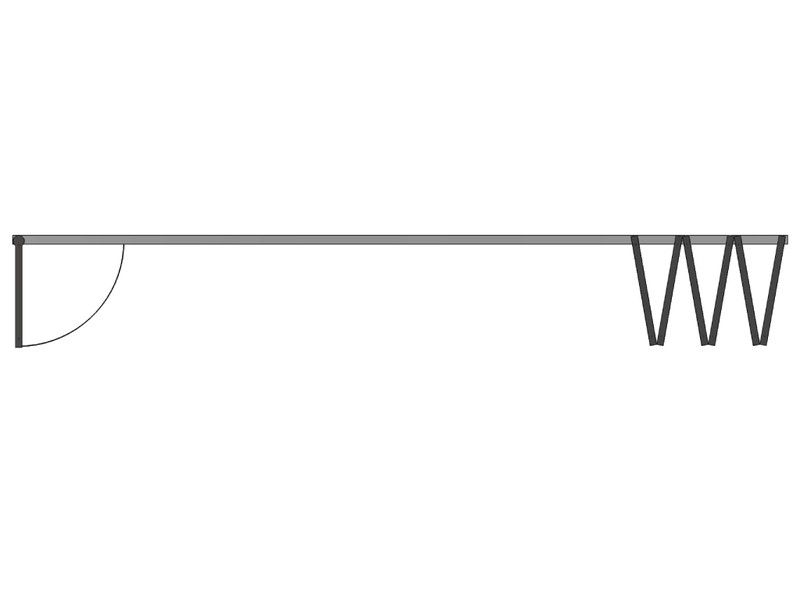 The sleek, modern interiors are both sustainable and design-forward. 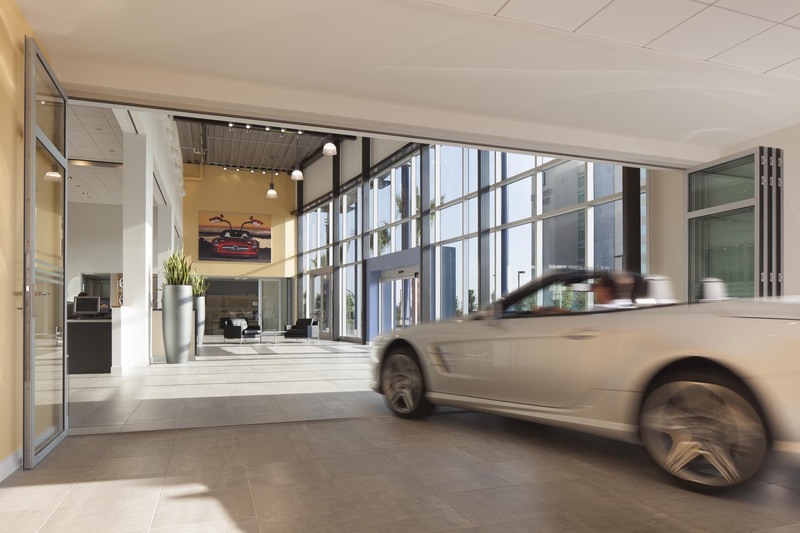 To get the LEED rating, Gensler employed a number of products with benefits to energy efficiency and occupant enjoyment. Bringing in daylight was another of those benefits that the NanaWall installation helped to provide. 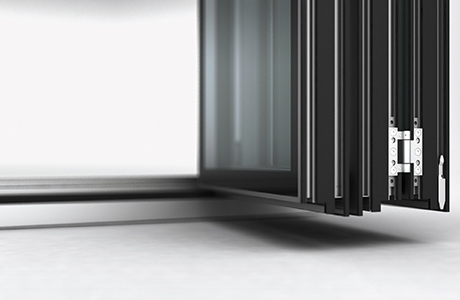 And NanaWall's SL45 system provides the necessary flexibility, transparency, sound attenuation and modern look that make the spaces effective as well as aesthetically attractive.